On Wednesday, November 14, 2018, members of the following organizations joined CIRC/Delaware members for the Annual Joint Holiday Dinner. 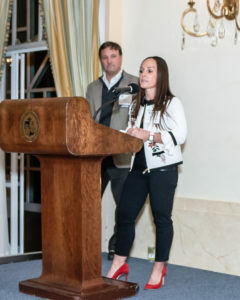 The event was held at the Dupont Country Club. 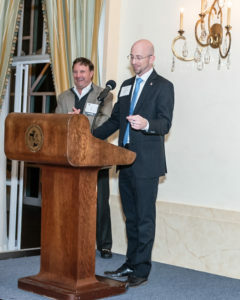 The featured speaker was Ben duPont, Chartline Capital Partners and Co-owner of the Dupont Country Club. 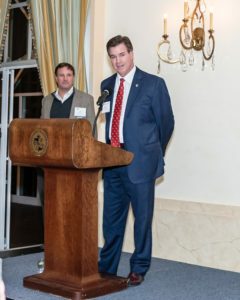 Mr. DuPont spoke about the recent acquisition of the Dupont Country Club and the vision for its renovation and repositioning for future viability. An underlying discussion theme was creating an economic development plan for breathing new life into UNDER UTILIZED assets, such as golf courses. Many experts say the golf industry is dying. The economic meltdown of 2008 did not create the downturn in the golf industry it just happened to be the convergence point of many key factors which created the Perfect Storm. A storm that turned 10 years old this September. Key factors causing the golf industry downturn include: an oversupply of courses; the number of rounds played annually has fallen perhaps caused by the waning of Tiger-mania, the aging of Americans beyond the point of enjoying golf, or millennials lack of interest in the game. In addition, there is declining membership at private clubs and courses. Over the past 10 years, 800+ golf courses have shuttered across the US. Golf courses and country clubs currently consume massive amounts of relatively underutilized land for redevelopment. Considering the average 18-hole golf course is 150 acres, developers have started to take note. When the DuPont Company put its Dupont County Club up for sale in 2017 it was in line with its strategy to offload non-core assets. 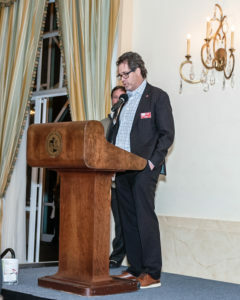 The club was sold to Ben duPont, a partner at Chartline Capital Partners, and Don Wirth, who retired from DuPont as vice president, Corporate Supply Chain in 2014. Rockland Sports has become the new ownership entity. The property, established in 1920, was originally built as an amenity for DuPont company employees. The club consists of 525 acres in Brandywine Hundred, improved with three, 18-hole golf courses, 25 tennis courts, and a 113,000 sq.ft. clubhouse. 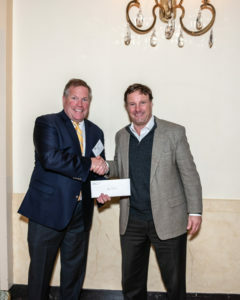 The club has hosted multiple professional and amateur golf tournaments – including four of CIRC’s annual golf outings – and the LPGA Tour’s McDonald’s Championship from 1987-2004. Another component is the 60-acre Brantwyn Estate, which features a three-story mansion with surrounding gardens utilized for weddings and other special events. The buyers plan to spend $18 million on capital improvements including a new swimming pool, 15,000 Sq.Ft. fitness center and new driving range located closer to the clubhouse. The buyer’s plan to reposition the property from a country club into an athletic and sports facility, with a goal to increase membership. The next CIRC/Delaware event is the Annual Holiday Party on Wednesday, December 12, 2018 at the University & Whist Club.